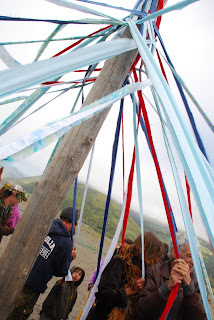 Our local Pagan High Priestess, Kirsten, once again organized our Mattole annual May Pole event, marking Lunar Beltane and May Day, which this year also fell on Mother's Day. 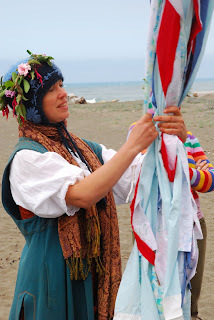 The Pagan celebration of Beltane marks the midpoint between Spring Equinox and Summer Solstice, the beginning of summer, and has traditionally been a celebration of fertility and virility, with the phallic symbology of the May Pole, as well as the ancient rites of the bonfire and the meeting of the goddess and the stag. This is much oversimplified, and I am not an expert by any means on this subject. It's definitely something to explore more deeply. 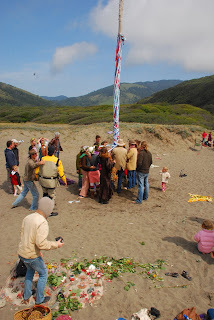 Anyhow, we gathered midday on Sunday at the beach, and a group of men went down the beach to collect the pole that Kirsten had selected. 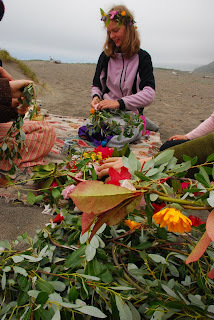 Meanwhile, we dug a hole to place it in, and made garlands of willow and flowers to wear on our heads. We drank May Wine (white wine with flower petals in it! ), ate hard boiled eggs, built a fire to welcome the fire element (and to cook hot dogs for the kids...not sure who brought the hot dogs! 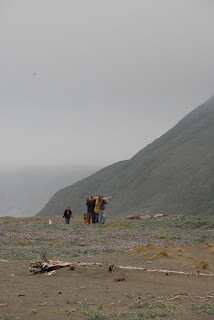 ), and just spent some time being together. 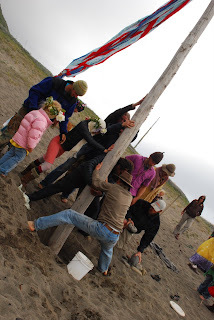 The collective community energy has been a little overcome with grief these last few weeks, as we are all still processing Cordelia's death. Her memorial was the day before at her family's home, a beautiful and full experience of grieving and celebrating, as one large family.